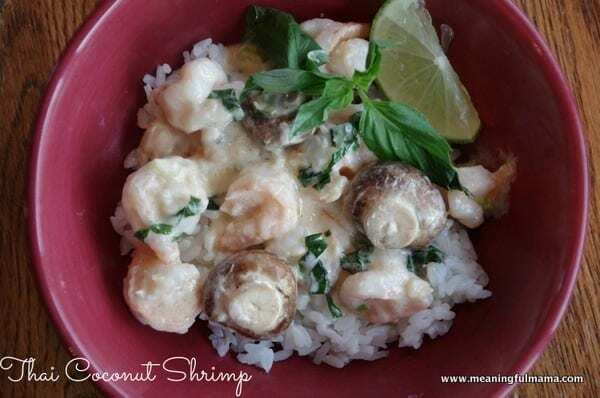 This Thai Coconut Shrimp recipe is easy and delicious. 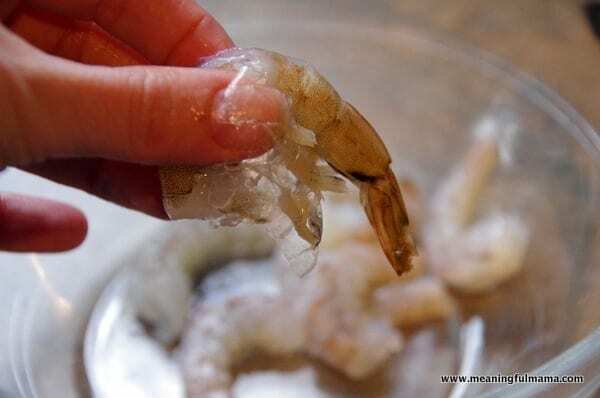 The most involved part of the recipe is peeling and deveining the shrimp. Other than that, the recipe comes together in a snap. 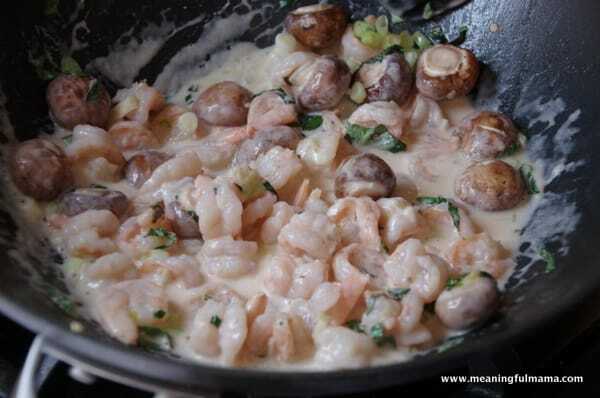 It would be a great meal to entertain guests, especially if you can prep the shrimp and mushrooms beforehand and have it all ready to throw in the wok. Cooking time is less than 10 minutes. 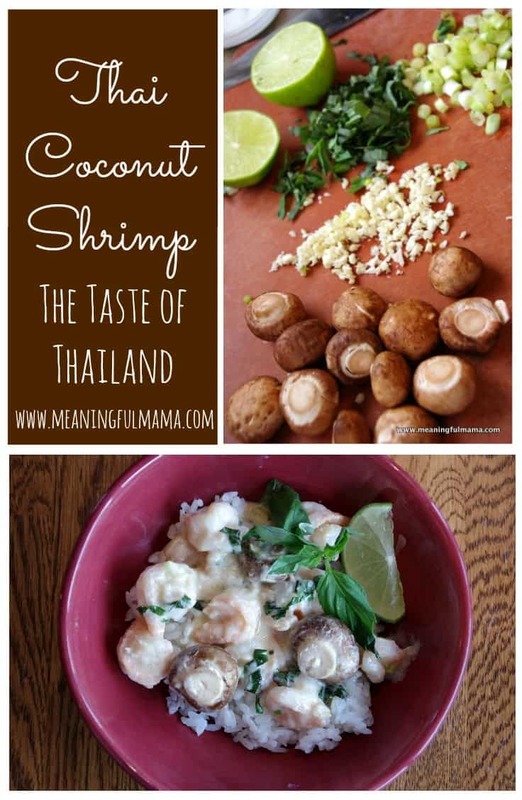 We love Thai food, and I am excited to add this one to the collection I already have going at Meaningful Mama. This recipe was handed down to me by one of my foodie friends. I grew up down the street from this woman, and her daughter and I played together all the time. We grew up together and have stayed lifelong friends. They are a family who enjoys creating and eating food, and this woman created her own family cookbook of their favorite recipes. It was a gift she handed down to her family. We are like family, so we got a copy too. There hasn’t been any recipe of hers that I have tried that I don’t make over and over. I think you’ll enjoy this one too. Shell and devein the shrimp, splitting them nearly in half. Pat dry and refrigerator until ready to cook. “Wash” mushroom and trim off ends of stems, set aside. I say “wash” because this involves rubbing them clean with your fingers. Mushrooms become waterlogged if they are soaked in water, so you want to avoid that. 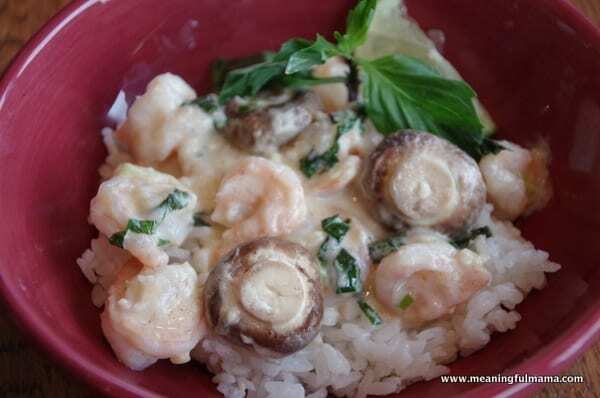 For sauce, in a small bowl combine coconut milk, white wine, chili sauce and salt. Set aside. Combine cornstarch with an equal amount of water. Set aside. Place wok or saute pan over medium-high heat. When very hot, add oil and butter. When butter melts and begins to bubble, add garlic. Sauté a few seconds, then add shrimp. Stir and toss shrimp until shrimp just turns opaque. 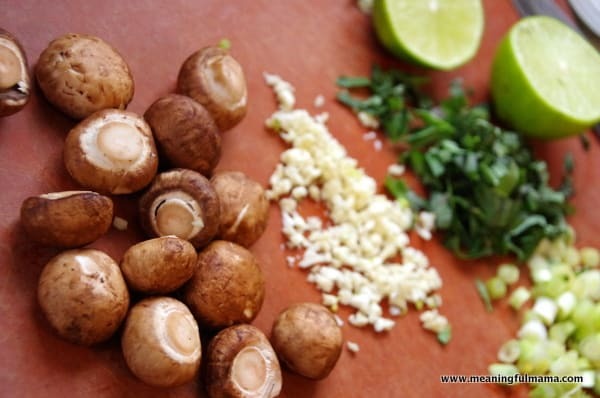 Add mushrooms, basil and green onions. Stir fry 15 seconds. Then add coconut milk. When mixture comes to a low boil, stir in a little of the cornstarch mixture to lightly thicken. Stir in the lime juice. Serve over buttered noodles or rice. Enjoy!